At once inspiring wanderlust, new beginnings, and strength, this painting by Rose Henges features a sprawling quote: "If adventures do not befall a lady in her own village, she must seek them abroad." Rose's original watercolor painting is reprinted in gorgeous detail, preserving the vivid colors and empowering message. Designed in Missouri. Printed and framed in Portland, Oregon. Received this a few days ago. It's great! Great quality print in a nice frame. The size is perfect...big enough to be noticed and small enough to fit anywhere! My daughter will absolutely love this. A one of a kind find only from Uncommon Goods! I am so pleased with this print, it is beautifully done with high quality framing. 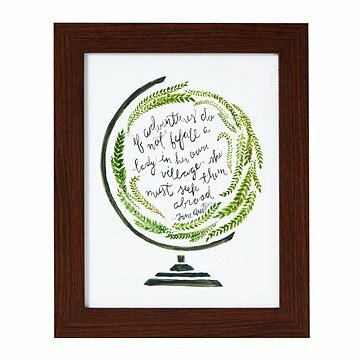 This beautiful watercolor print is highlighted by a thought-provoking quote by Jane Austen.